I loved going to Blue Jays games at Exhibition Stadium. Some called it the mistake by the lake, but to me it was where my Jays played and that was everything. George, Damaso, Ernie, Jesse, Lloyd, Dave, Alfredo, Tony, Willie, Rance... so many memories. 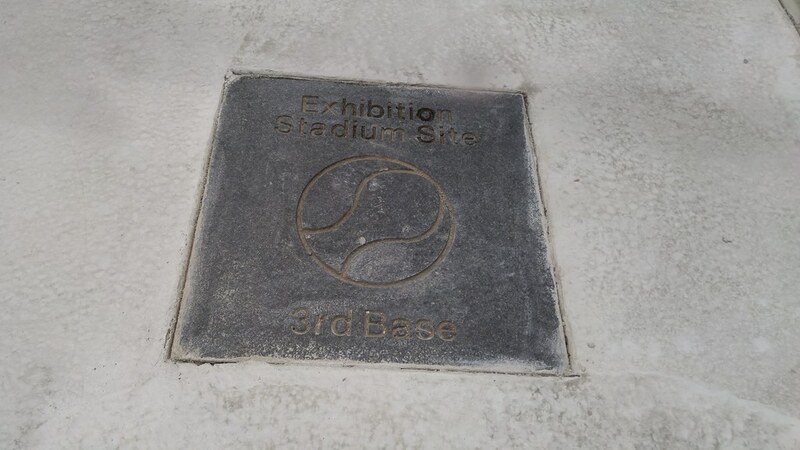 At the precise spots where the bases used to be, they've put cement markers. I think this is very cool. 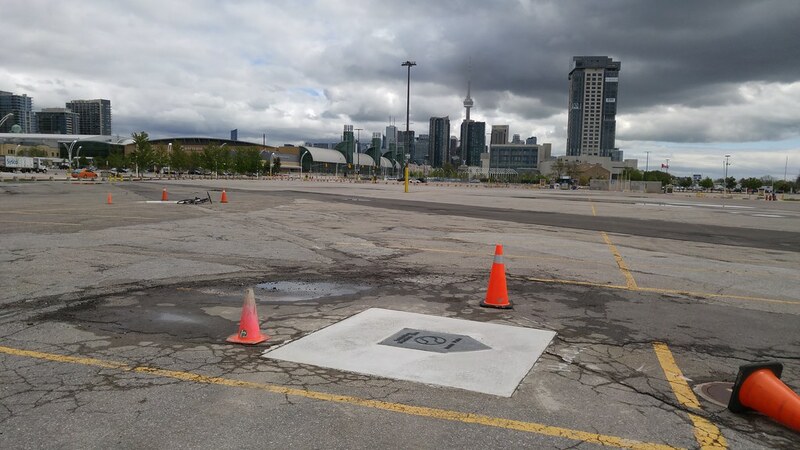 Even though it's a parking lot now, it's neat being able to see where our Blue Jays played before the dome. 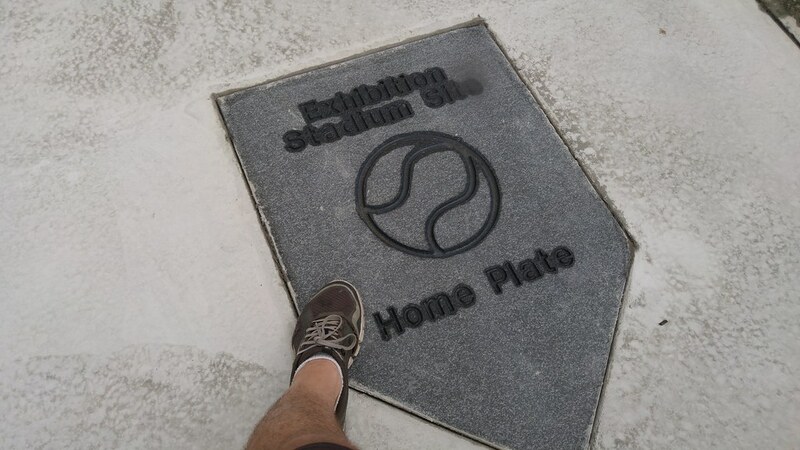 I biked over today to snap some pictures and step on home plate. First game(s) I ever attended was at Exhibition Stadium, a summer of 1983 doubleheader between the home team and the White Sox. How people cannot love baseball is an unsolvable mystery. You'd be shocked to learn how many young people do not love baseball, including my 15 year old son. And I raised him on the thrill of the grass! The apple fell far from the tree, then even rolled down a hill in his case! I've lived on dead-end streets where the pavement is less cracked, broken up, and pot-holed than most of Exhibition Place. 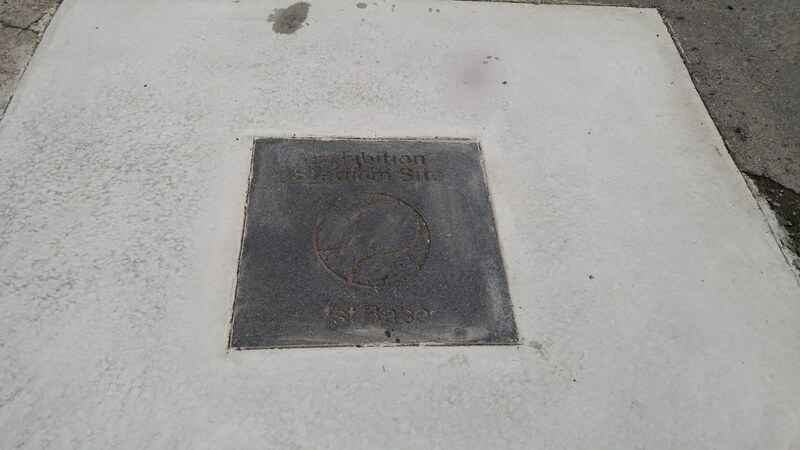 Similar to the center ice dot at Loblaws at the old Maple Leaf Gardens. I'm not a big ball fan either. I cheer for the jays and will watch the odd time. Been to a few games but am usually bored silly by the 6th inning. 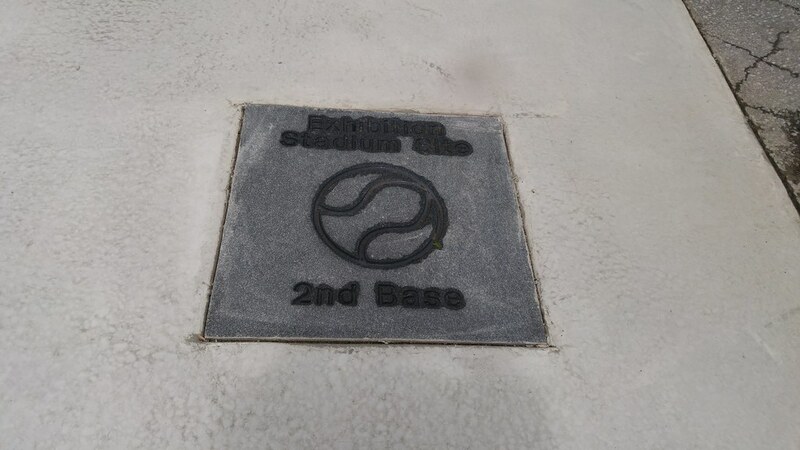 It seems these base markers have been there for a while, but have just been refreshed with the concrete around them. All I know is I saw my city councillor tweet about them yesterday and biked over today to see them, thinking they were brand new. 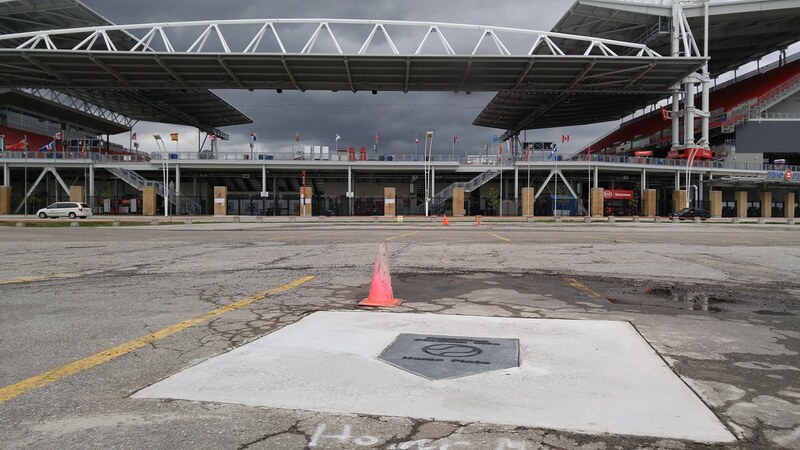 Loved the EX stadium..spent many hours there watchin' The Argos,Jays and The Hell Drivers. Matter of fact have a seat from there Row 3 Seat 2 Third base side for baseball,End-zone for football. The Joch Kochman Hell Drivers ruled in the 60's-70's at the Ex every afternoon during the CNE. Saw them multiple times. Why oh why don't parents have their kids wearing helmets when riding their bikes. Witnessed a Mom (wearing a helmet) riding on the street & young daughter just learning to ride a 2 wheel bike not wearing one & steering recklessly on the sidewalk. I was gonna say something but not my territory, a parents decision & terrible 1. My biggest memory is from seeing Genesis there in '82 on the 3 Sides Live tour. Awesome. As for a Jays memory...saw them on the Friday night of their last homestand in 87 just before they blew their division lead in the last week of the season and broke my heart. Broke it into a million pieces. Thanks for telling us about these markers. I had no idea they existed. We were at an event this weekend at the Queen Elizabeth Theatre and I intentionally parked in that lot so we could check these out.